Thursday April 25 1907 The boys began to plow down on the Woolf land I was busy with the work all forenoon and went in town for treatment in afternoon. Was not gone long I rested awhile and did evening work. I have chickens hatching. Friday April 26 1907 I worked all the forenoon with the regular work and taking care of my chickens. I remade Mothers dress skirt in afternoon Will went to town in afternoon. Saturday April 27 1907 I had churning and baking and Will did some work in the garden for me and cleaned the hen house ready for my little chickens I have 78 of chi last batch. I washed out Mothers skirt after dinner and worked out of doors some. Will went to town. Mrs Robinson here in evening. late with my work. 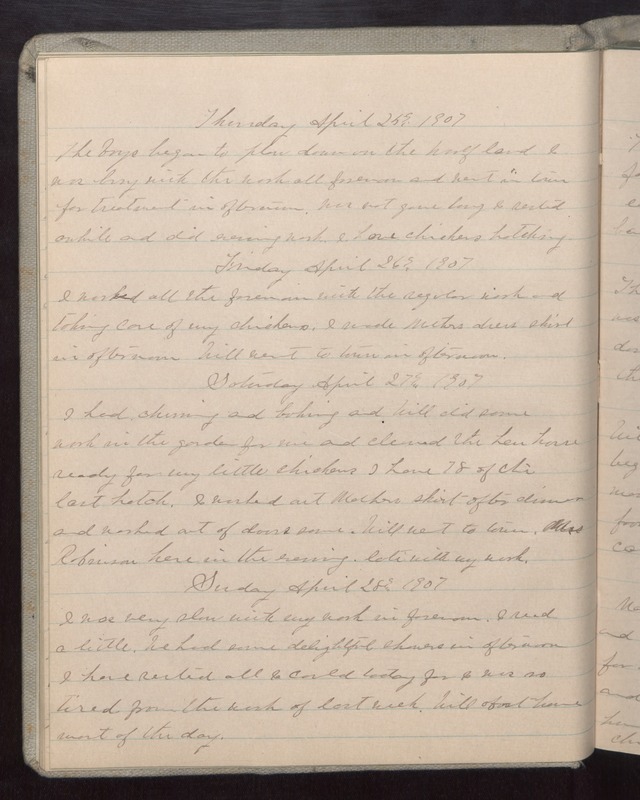 Sunday April 28 1907 I was very slow with my work in forenoon. I read a little. We had some delightful showers in afternoon I have rested all I could today for I was so tired from the work of last week. Will about home most of the day.